Cooking for a pet is not a matter of portioning out a little of what the human family is eating. Not if you want your pet to live long and prosper. 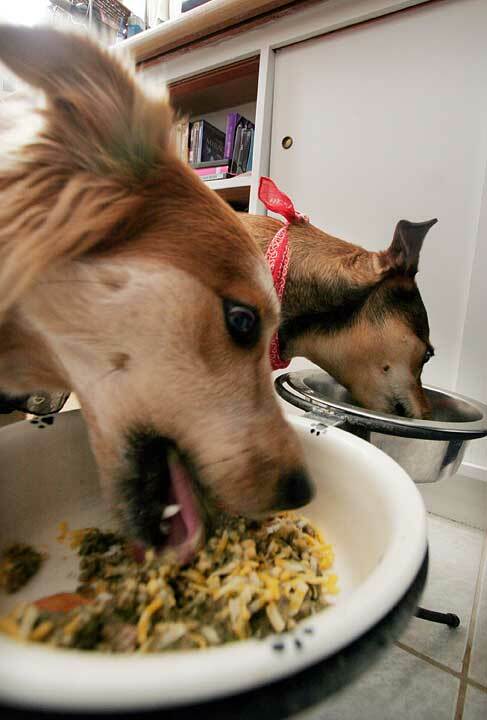 Putting your dog or cat on a long-term diet of homemade food is a commitment -- of your time, effort and dedication. Marianne Schultz figures it takes her six to eight hours to prepare 10 days' worth of food for her two dogs. "It virtually takes me almost all day to do this." But she's certain it's worth the effort. Schultz started cooking in 1995 for Maggie, a part basenji-part pit bull that she and husband Scott called a "basen-bull." It wasn't a fear of contaminated pet food that started this -- Schultz just felt she could do better for Maggie. So she did her research and consulted Maggie's veterinarian, who made some suggestions, but basically approved Schultz's plan. And the cooking began. Maggie's been gone a couple of years now, but Schultz continues to cook for her two new dogs, Koele and Manele. She's serious about her ingredients. "When it's dog food day at our house, I have stew meat, I have a bag of those little French carrots from the grocery store and I have celery and beets with the beet tops, and maybe some of those red potatoes from the farmers." Usually her beef comes from the North Shore Cattle Co. "I know where it comes from and I know what the steers are fed." This all becomes the basis of a stock. If the humans have had a dinner that yielded bones, so much the better. 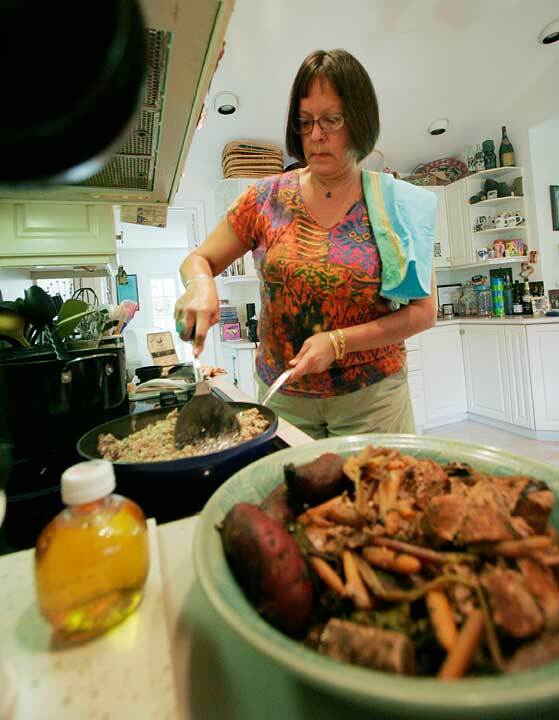 "If we're really lucky I'll have lamb bones or steak bones and cook that in too, to get the flavor." And that's just Step 1. She's never added up the cost, but figures it would be $15 to $20 a batch. The finished food is portioned into daily allotments and frozen. It'll be served with a bit of all-natural yogurt. Schultz has no (human) children, but she was working full time when she started cooking for Maggie, so it was a juggling act. She's now a correspondent for the Internet site Hawaii Diner. 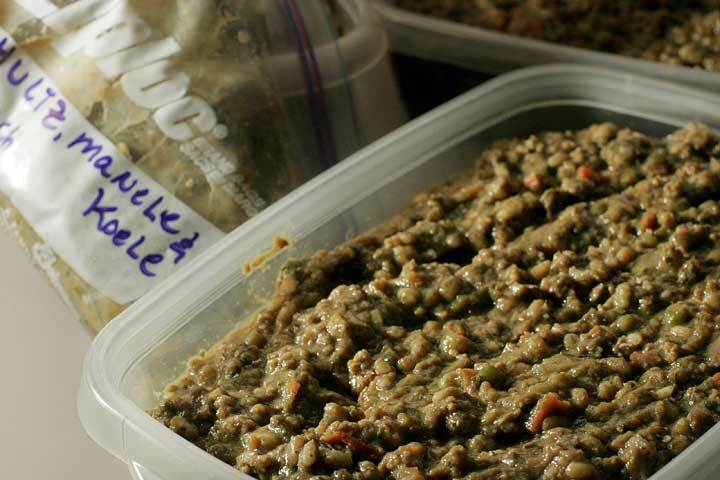 Whatever your own commitments, she said, the decision to devote yourself to homemade dog food has to be based on knowing it's not easy, but that your animals will be heather. Her vet has confirmed that about her dogs. This week, dog-food production is in high gear because the Schultz humans are going on a trip. She'll make three batches so she can leave enough behind at the kennel. "It is hard," she said, "but I feel a whole lot better doing it." » Avoid highly processed foods and those loaded with preservatives, artificial flavorings and artificial sweeteners. » Cook the meat. Although it may seem natural for an animal to eat raw meat, "if Fluffy lived in the wild, she wouldn't live to be 15," said veterinarian Sherry Sanderson. Besides, most meats come through very human methods of distribution and processing, and are meant to be cooked. » Avoid especially fatty foods, such as chicken skins. A high-fat diet can lead to a condition called pancreatitis in dogs, which can be life-threatening. » Follow recipes carefully. Foods that might seem reasonable substitutes or nutritional sources in a human diet will not necessarily work for pets. 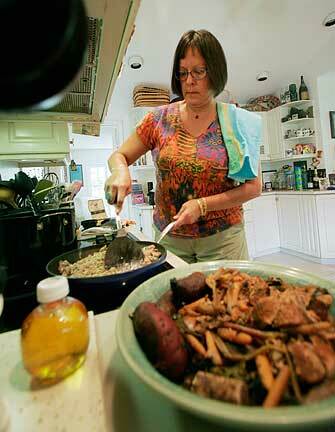 » Use nutritional supplements formulated for use with homemade diets. Regular commercial supplements are designed to be used with commercial pet foods, which already include essential vitamins and minerals. » Just as with commercial foods, do not feed a puppy or kitten food meant for adult animals. They have special dietary needs. » Run your menu plan past your veterinarian to be sure it meets all the animals' needs. » Keep up with vet visits to be sure your diet is working. » If your pet should come down with an illness, your vet will need to know exactly what the animal has been eating in order to make a diagnosis. » Davis Veterinary Medical Consulting, in Davis, Calif., calculates and sells home recipes customized to the age, weight and reproductive status of dogs and cats. Visit www.balanceit.com.